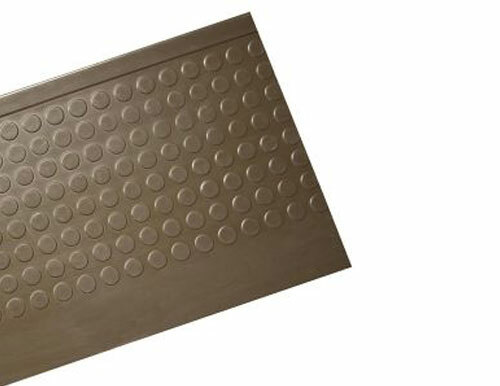 Sure-Foot’s anti-slip stair treads come in a variety of colors and designs, such as this dark brown modern stair tread. Our goal is to provide you with anti-slip products that ensure safe footing, while not compromising the aesthetics of your stairs or walkways. These rubber stair treads are an easy to maintain, affordable solution to provide your pedestrian traffic with safe walking conditions. Our vinyl and rubber stair treads provide safe interior stair coverings perfect for a wide variety of buildings such as industrial, commercial or medical. Typical installations include hospitals and medical offices, commercial buildings and schools.